The following picture is in a photo album of images from my great grandparents travels. I didn’t know how Sister Genevieve Parker fit into my family tree. None of my branches contained anyone by that name, but nuns sometimes adopt new names when they take their vows. Last fall, after I tracked down my third great uncle James Parker in California and some of his family, I suspected Genevieve belonged in that branch of the tree. But where? Mother Genevieve was elected the first Mother General of the newly established California Institute of the Immaculate Heart of Mary. She guided the Community for nine years. 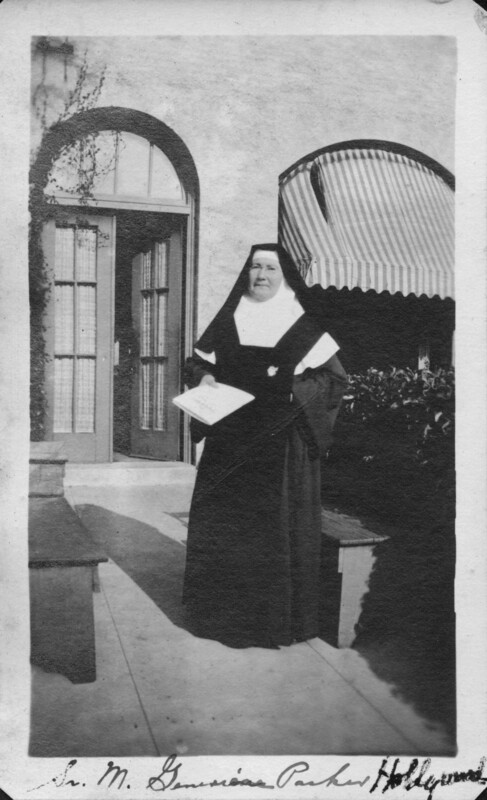 Mother Genevieve was instrumental in securing the separation of the California IHMs from the Spanish Community. The negotiations for independence of the California group went on for several decades. With the help of Bishop John J. Cantwell the separation was completed in 1924. … She guided the Community as an able administrator until her resignation in 1933. She died in July of that year. Pretty much the same person! And now I have a date of death and a pretty good starting point on digging up the rest of her life. Interestingly, I still don’t know exactly who she is. In the 1870 U.S. Census, James Parker has 4 daughters: Catherine, Mary, Ella, and Frances. In 1880, his daughters are Kate, Ella, Fanny and Theresa. Mary is Mary Lyons. Ella is Ellen Parker Murphy. I suspect Theresa married a Frederick Donaldson, though I haven’t proven that. That leaves Catherine or Frances. At this point, I just don’t know which of the daughters she is.